As Hamas continued firing rockets at Israel, Arabs continued rioting in the rest of the country. As Hamas continued firing rockets at Israel, there were numerous incidents of rock throwing by Arabs throughout the country. Arabs threw rocks at Israeli drivers on several of the country's main roads, including Road 2, the coastal highway. 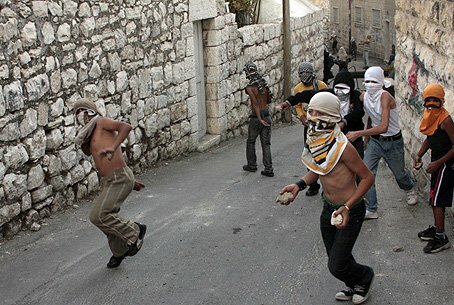 Arabs from the village of Jizr a-Zarka, located next to the highway, threw stones from a bridge over the highway at passing vehicles. No one was injured in the attacks. Two residents of the village were arrested. On Sunday night, Jerusalem police arrested 22 rioters from the village of Azariya who threw rocks at police, as forces attempted to quell a melee in which dozens of Arab residents faced off against them. The rioters were held overnight Sunday for questioning. According to a spokesperson for an Azariya community group, 375 Arab rioters have been arrested so far in July, with 135 of them indicted on various charges. A riot in Yatta, in the southern Hevron Hills, left three Arab rioters injured when they attacked IDF troops. Three other rioters were arrested. Meanwhile, tens of thousands of Arabs demonstrated on the Temple Mount Monday against the IDF's operation in Gaza. The crowd, estimated at 45,000, shouted anti-Israel slogans, demanding that Hamas kidnap more soldiers, and swearing that they would “shed their blood for Gaza.” Others wore T-shirts proclaiming support for Hamas's armed wing, the Izz-a-Din al-Qassam Brigades, which has been locked in a 21-day confrontation with Israeli troops in Gaza. Police distanced themselves from the crowd which soon dispersed without incident, a witness told news agencies.